Insert battery POSITIVE side first into flashlight, failure to do so may short-out the flash light. Do not look directly at the beam, even the reflected UV light. 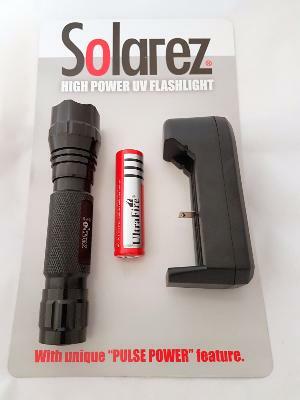 The "High-Output" Torch(88901)isa kit with a flashlight, battery and charger. It has a very strong 2.5” diameter beam. It also has a second "click” function where it pulses at 1 second intervals. It is a great way to rapidly cure some of Solarez’ hottest resins while not accumulating as much heat which causes yellowing or distortion. Of course, you can always attenuate light yourself by moving the flashlight but the pulse function is nice automated feature.